In its 2014 Annual Wage Review decision the Fair Work Commission (FWC) decided that the 'appropriate reference household for the purposes of setting minimum wages is the single person household' (the single person benchmark). This was the first time in more than a century of minimum wage setting in Australia that an industrial tribunal has decided that minimum wages should be set on that basis, thereby excluding considerations of the needs of the low paid with family responsibilities. The legislation under which the FWC operates does not require the single person benchmark: it was a policy decision by the FWC for which no notice was given or reasons supplied. The Australian Catholic Council for Employment Relations (ACCER) has lodged submissions in the current wage review, arguing that the single person benchmark is contrary to law. We need to see this development in the context of changes over the last four decades. In August 1973 a single breadwinner couple with two children, where the breadwinner was on the lowest minimum wage rate, had a disposable income of $58.50, of which 7.7 per cent came from transfer payments. The lowest minimum wage rate is now the National Minimum Wage (NMW). By the time of the FWC’s decision in 2014 transfer payments accounted for 39.3 per cent of the NMW-dependent family's income, assuming the children were 8 and 12 years old and that the family was entitled to maximum rental assistance. In January 2015 transfer payments for this family were $380.59 per week. The increase in family payments had reduced reliance on the wage packet, but had not eliminated it. On the face of it, the position of families should have improved. But this was not so because the value of the wage component relative to average wages has been declining for many years. Changes in wages, taxes and transfers are reflected in poverty line comparisons. From January 2004 to January 2015, the NMW-dependent family of four fell further into poverty: from 3.3 per cent below the poverty line to 8.7 per cent below it, with a poverty gap in January 2015 of $91.91 per week. Over the same period the NMW-dependent single worker’s margin over the poverty line fell from 25.9 per cent to 15.8 per cent. What was a manifestly inadequate wage in 2004 was a grossly inadequate wage by 2014 when the FWC adopted the single person benchmark. Families were deeper in poverty. The NMW was a poverty wage. The single person benchmark was adopted three weeks after the delivery of the May 2014 Budget when the Treasurer, Mr Hockey, in explaining the cuts to family benefits said that 'family payments are an income supplement to help with some of the costs of raising a family' (emphasis added). While there is substantial dispute between the major parties on aspects of the Budget, both agree on this point: family transfers are not intended to cover all the needs and costs of a worker’s dependants. The prospects of real increases in family payments over the short and medium terms are zero. In its submissions recently filed in the Annual Wage Review, the Australian Council of Trade Unions (ACTU) stated that it would 'accept' the FWC’s 'decision to focus on single person households'. Nothing is more likely to hurt the working poor than the policy accepted by the ACTU. A fair minimum wage has to be fair to workers with family responsibilities, many of whom are currently working poor and living in poverty. The ACTU is not fighting for what has been a fundamental principle of wage setting for more than a century, i.e. minimum wages should take into account the living standards and needs of workers with family responsibilities. The pursuit of fairness and justice for workers with family responsibilities has been a key driving force of the trade union movement's representation of working Australians. The ACTU’s decision could not be explained by any belief in the capacity of the Commonwealth to increase family payments to cover the needs of a worker’s dependants. The ACTU’s position may be explained by the fact that it has very few members among those workers employed on minimum safety net rates, estimated by the Australian Bureau of Statistics to have been 1.86 million in May 2014. The ACTU’s website states that workers who 'are under a union collective agreement earn on average $100 a week more than other employees'. In view of this, the ACTU decision-makers may have determined that its members would be able to overcome the problems inherent in the single person benchmark decision. 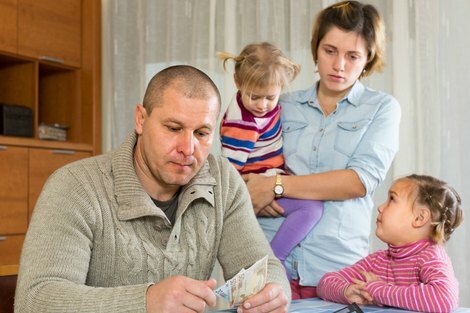 In the absence of the FWC reversing its single person benchmark decision, or having it reversed by judicial review, low paid workers with family responsibilities will face increasing poverty. ACCER has written to the ACTU asking it to re-consider its position on the single person benchmark and to affirm its traditional support for the setting of minimum wages that include the recognition of the needs of workers with family responsibilities. Submissions in reply are due to be filed with the FWC by Friday 17 April 2015. This will be a very significant day in the life of the Australian union movement. Family finances image by Shutterstock. It becomes a much greater problem when those committed to mortgages cannot maintain a healthy standard of living on what is left. We need to continue to push for super reform that will enable governments to level the playing field for all Australians. Like you say Brian I am staggered that the ACTU has changed its policy on the minimum wage. Who now represents, speaks for and organisers amongst the lowest paid workers? It is worth enlisting Get-up to needle the ACTU? It seems that this was a decision of the FWC supported by the ACTU but it is represented in the title of the article as a Government "trick". Why that title choioce? It has been obvious for some time that the Unions and so the Labour Party represents only a another quite well off sectional interest. They are now a waste of space; no vision and no future as they are. Those that represent the poor are the churches and NGOs "in the field" such as Vinnies. This is a really good article although perhaps it does not go far enough in analysing the interactions between "wages" and government social payments for the poor...and how to some extent the latter have been high-jacked by the better off and so diluted in effect. A problem with government social payments is that they are just too low! Really across the board they are too low for those who really depend on them to have a decent life i.e. the poor; not so the more middle class for who it is a top-up. What needs to happen it seems to me, is that there should be a guaranteed total income for a person or family that relates to average industrial male earnings (say 100% for a family of 4, and say 70% for a single person...or whatever it takes). The minimum wage is probably a good thing as an icon, but should not be set so high that it impedes employment opportunities, because jobs are important in themselves. The rest should be borne by the tax-payer as focused payments to the poor members of society (only). There could be some gaming of this system by employers, but tany increase in profits should be clawed back through the tax system. Wonderful exposure of a very sad story. The ACTU's, and the FWC's, responses to letter/submission would be good to know.